Keith Rutledge, director of the Siloam Springs High School Band, sent in this one, courtesy of the Old State House Museum. 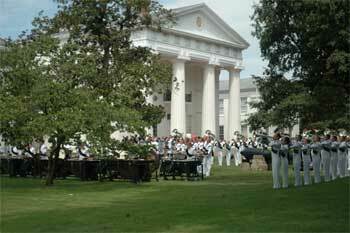 "Phantom Regiment presented a standstill performance at the Old State House in Little Rock, Ark., on July 28, 2005, for the Arkansas Bandmasters Association Convention. We would like to thank Patrick Seidling and Phantom Regiment for their concert as well as for the great student/director clinic the same evening. The clinic was sponsored by the North Little Rock High School and Siloam Springs High School Bands." Thanks Keith! E-mail your best shots from the summer to dave@dci.org along with where and when the photo was taken. Send some biographical information about yourself as well. We'll give you full credit. Also, let us know if you want your e-mail address included.